Screen preparation: The importance of degreasing screens. Degreasing screens, do you have to do this? That's a big yes! 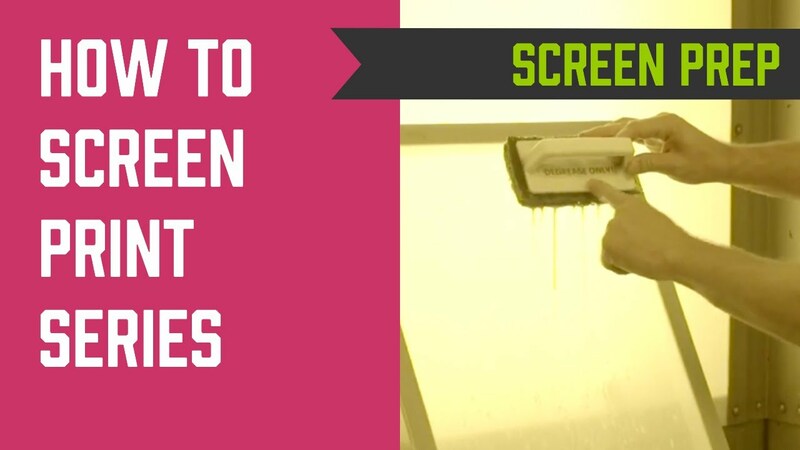 If you purchase a new or used screen, YOU MUST DEGREASE THE SCREEN. Never jump the direct coating stage! Here's why it's important to degrease your screens prior to applying direct emulsion: If you purchase pre-stretched screens or you stretch your own screens, keep in mind that the mesh has been handled and has been subjected to the surrounding conditions, oils, dust, and dirt. Those factors will always find a way of making it on to the surface of the mesh. If those elements are not removed they will cause the emulsion to separate around the effected area and may cause premature screen breakdown! Here are some examples of screen breakdown. THE FISH EYE: is an area of the screen were the emulsion has separated away from the mesh. It resembles a Fish eye. PIN HOLES: This is the most common of all screen problems, small random holes that show up during the print process. Sometimes they can be detected by looking through the screen. You can use a water based screen block out to seal off the unwanted areas or plain old transparent tape will work too. Pre Rinse both sides of the mesh with water. A pressure washer is recommended however a garden hose with a dial setting will work too. For this next step you will need a clean scrub brush and a spray bottle. Pour the contents of your Degreaser liquid into the spray bottle. Spray a small amount onto the surface of the screen. Take your brush and scrub from top to bottom or side to side on both sides. Turn the screen to the inside portion of the frame. It really does not matter what side you rinse first but I prefer to do the inside first. My reasoning for this is the degreaser is essentially soap and when activated by water it's going to find places to hide, like in the corners of the frame. Start your spray from the top and sweep from side to side, working the spray downward. Flip the screen and repeat the process. Continue to rinse until the bubbles disappear and the water runs smoothly down each side of the screen. That's it. Be sure to rinse all soap residue off the screen, left over degreaser can also act as a barrier between the mesh and the emulsion. Now you have successfully rinsed your screens they have to dry before you proceed to the coating stage. Yes they can air dry, but you don't want the water residue drying on them either. You also want to dry in a DUST FREE area. A forced air fan or forced air space heater work fairly well. However if you're in a hurry, you may wondering how to speed up the dry time? Here are a few tips that I have used in the past. Use a hair dryer. It's a great way to get the excess water out of the screen. Don't get to close to the screen, the heat could damage or destroy the screen! An air compressor with a hose attachment will remove the water from the screen very quickly! Be careful with this however, some air compressors have water and small amounts of oil in their lines. Place a box fan next to the screens in a warm area to evaporate water quicker.